For a few lucky fans who sent direct messages to Mercedes-Benz USA via Facebook and Instagram this past holiday season, Mercedes-Benz sent back more than a simple response. 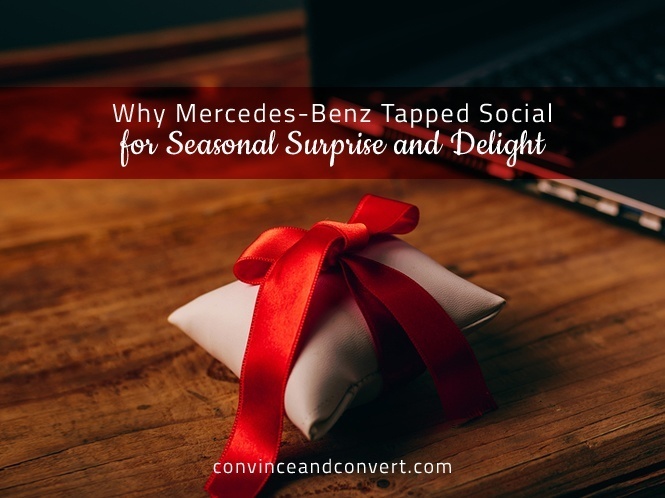 Inspired by the approximately 100 messages the company gets on Facebook and Instagram every day, the company launched the #MBSecretSanta program to reward customers—current and prospective—who engaged with the company via direct message. Through the #MBSecretSanta program, Mercedes-Benz and agency Razorfish gave away 1,000 prizes leading into Christmas to customers in the United States. A quick scan of the #MBSecretSanta hashtag on Instagram reveals some sweet prizes have already been doled out, from Mercedes-Benz branded baby gifts to golf sets. Watches and Bluetooth speakers were also up for grabs. So, what can you learn from this seasonal surprise and delight initiative? Think beyond the direct message as a customer service function. Direct messages offer a prime opportunity to engage with customers on a 1:1 basis, driving a more personalized relationship with your company. While this function tends to serve customer service the best, Mercedes-Benz’s #MBSecretSanta program showcases that it can do so much more. To sprinkle in your own surprise and delight magic, audit the types of responses your company gets via direct messages to understand key areas of opportunity to do more than just solve a problem or answer a question. If your audit reveals mostly customer service issues or questions, consider a surprise and delight type initiative where all or a randomly selected group of customers are sent a small token of appreciation as a way to drive more positive perception in the long term. Investing in unique, quirky, or just downright cool branded items is an opportunity that not enough companies seize. Cute baby items or customized golf sets both feel special and are aligned with Mercedes-Benz’s target audience. If you’re a highly recognizable brand, one-of-a-kind items will dazzle your most passionate customers and prospects. For smaller companies, unique items with a “cool factor” can make you more memorable and drive brand equity. Don’t believe me? Read This. The challenge with developing branded swag your customers will love? As with any kind of gift giving, it’s not always easy to anticipate what will be the most appealing to your customers. Here are some tips I’ve cultivated to help inspire your efforts. The key to keeping surprise and delights fresh on an ongoing basis are programs like #MBSecretSanta. Whether it’s an exclusive experience, a trending topic, time of year, or a customer’s wish, surprise and delights need to be created with the customer experience in mind. Additionally, staying in touch with customers that have received a surprise and delight is critical. Imagine the amazing feeling of receiving a surprise gift from a company and then never hearing from them again. That’s not to say that you have to go crazy, but find a cadence that feels right, both for your company and your advocates.